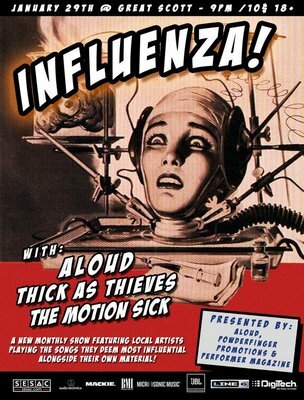 Tomorrow night (Thursday, January 29) is the premiere of “Influenza,” a new Boston-based monthly show that features local artists playing a mix of their original material and covers of songs that influenced them (hence the title). I think this is a great idea – one of the things that makes it a little tough to see a new band for the first time is the absence of the familiar. You don’t really know what they sound like, or what to expect, and unless you are a dedicated neophile, that’s a little off-putting. “Influenza” makes it a little easier to go out and try some new music, because you know you’ll hear something you’ll recognize, even if it’s from a band you’ve never heard before. Conversely, however, you’ll get to hear original music too – it’s a far cry from cheesy cover bands. So go check out the show tomorrow night at Great Scott. If you need some additional motivation, this show includes z=z faves (and fellow bloggers) The Motion Sick.